NCpedia will be down from 4pm until approximately 5pm on April 23, 2019. The Inter-State Farmers' Conference, held in Raleigh in August 1888, was the Second Annual Meeting of the Inter-State Farmers' Association. The association had been formally organized by elite southern agriculturalists in Atlanta in 1887. Delegates to the Atlanta meeting were chosen by the governors of several southern states. 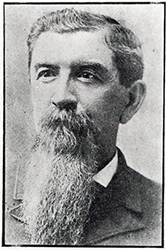 Leonidas L. Polk, former North Carolina commissioner of agriculture and then editor of the Progressive Farmer, became the association's first president. The three-day Raleigh conference, which began on 21 Aug. 1888, attracted delegates from nine southern states. It was described as the largest convention ever held in the city. Polk was again chosen as president, and Elias Carr, an Edgecombe County planter, was selected as an officer from North Carolina. The delegates heard a speech from Governor Alfred M. Scales, attended the laying of a cornerstone at the new Agricultural and Mechanical College in Raleigh, and spent a day touring Durham tobacco factories. They also adopted resolutions favoring southern manufacturing, a national Department of Agriculture, stronger federal railroad rate regulation, the prevention of trusts, an end to the national banking system, an increased money supply, and diversified farming. The Inter-State Farmers' Association held its last meeting in Montgomery, Ala., in 1889. By that time the more radical Farmers' Alliance was the stronghold of the rural reform movement in the South. Robert C. McMath Jr., Populist Vanguard: A History of the Southern Farmers' Alliance (1975). Lala C. Steelman, The North Carolina Farmers' Alliance: A Political History, 1887-1893 (1985). "Our Southern Farmers Meet in an Inter-State Convention for Consultation and Organization." The Southern Cultivator and Dixie Farmer. September 1887. p.423-424. http://books.google.com/books?id=x3ZNAAAAYAAJ&lpg=PA424&ots=JWX9ibf5Eq&dq=%22Inter-State%20Farmers'%20Association%22&pg=PA423#v=onepage&q&f=false (accessed November 27, 2012). Inter-state Farmers' Association. 1887. Proceedings of the ... annual meeting of the Inter-state Farmers' Association. United States: The Association? "Photograph, Accession #: H.1949.59.1." 1945-1949. North Carolina Museum of History. 1 January 2006 | Hunt, James L.